For years you've been seeing two-way radios everywhere you've gone. The usher in the movie theater was using them, the engineer at the hotel you stayed at, the security guard in the casino, the front desk supervisor at the office building, even the football coach in the game you were just watching, now it's your turn at your job. Your organization has decided to make the jump from cellular to two-way radios and it's your responsibility to set up the communications but you don't have the slightest idea as to what would be best. When deciding on the appropriate two-way radio there are some questions you need to ask. Mobile vs. Portable - How are you planning on using the radios? Mobile radios are units that are installed in a vehicle like what a bus driver would use. Portable radios are your "typical walkie-talkie" - units that can be carried around. UHF vs. VHF - UHF ("Ultra High Frequency") 403-512 MHz is used primarily for indoor applications where there may be some obstacles. VHF ("Very High Frequency") 136-174 MHz is better suited for outdoor applications without much interference. Number of Users/Number of Channels - The number of people using your radios system should be considered when thinking about how many channels you would need. Also consider if you need private channels for management, security, emergency etc. Number of Locations - How many locations will be using the radio system? Multiple locations can be linked allowing you to communicate from one location to another or you can have radios for a particular building only. Features - In an utopian world, what features would you like on your two-way radio? Do you need a "man down" alert? Would you like to be able to text message? Do you need a display that will show names? Depending on the unit chosen, those features are a few of the options available. Ruggedness - Do you require intrinsically safe units? Are your radios going to primarily be used by executives or do you need a more rugged unit for the maintenance workers? 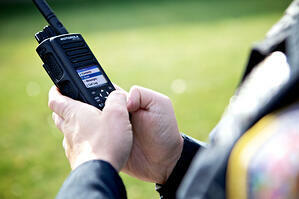 Budget - The pricing of two-way radios range depending on the units and features. It's a good idea to have a budget in mind when you start talking to a sales rep about your wish list. Put together a list of what is an absolute must and also what you would like if possible. Don't be overwhelmed with the options available. Start by asking yourself the questions above. Below is a link to a radio selection guide that should also help you see what options are out there. Call your local radio dealer and they will help guide you through the process. Once you have your radios up and working you'll wonder why you waited so long to switch. Two-way communications have been around, in some form, since the late 1800s. Through the years, with technology ever-changing, they have morphed from the original incarnation that replaced carrier pigeons to the technologically advanced units of today. Who would have thought back in 1885 when Heinrich Hertz proved that electricity can be transmitted in electromagnetic waves that in 2015 people would be able to communicate with both voice and text from a unit that can be worn on their belt loop? Radios have been an important part of communications within companies and/or public safety organizations for quite some time. In the past, they were used strictly as voice communication between one person and another or perhaps messages were relayed through a base unit with a dispatcher. While today's two-way radios still allow for person to person voice communications and also for a base unit with a dispatcher, there are many advances which allow for increased efficiency and streamlining in your business. Today there are radio options ranging from voice only to "smart phone" type devices. These newer units have the capability to cover mission critical and professional needs. There are applications designed to help with command and control, email and text, interoperability, location tracking, system monitoring, voice dispatch and work ticket management. In the past, radios were used on a conventional system, while this is still available, Motorola Solutions has made many technological advances. Now radio systems can be Conventional, Connect Plus (multi-site digital trunking that enables you to accommodate high volume, wide-are communications), Capacity Plus (a single-site, scalable digital trunking solution that lets you expand the capacity of your MotoTRBO two-way radio system), Linked Capacity Plus (integrated voice and data in a single site or across a wide area without the use of a separate network controller), or IP Site Connect (uses the internet to extend the coverage of your MotoTRBO system regardless of where you are). Two-Way radio was previously treated as a voice only communication device, now it is a solution to increase your productivity, efficiency and safety. All of these options can seem overwhelming so my best suggestion is to getting started would be to take a deep breath, sit down and make a list. Make a list of your obstacles and your goals then contact your local radio dealer and they can help you develop the solution that works best for your needs and your budget. You'll never look at a walkie-talkie the same again. MOTOROLA, MOTO, MOTOROLA SOLUTIONS and the Stylized M Logo are trademarks or registered trademarks of Motorola Trademark Holdings, LLC and are used under license. All other trademarks are the property of their respective owners. © 2015 Motorola Solutions, Inc. All rights reserved. With the end of the calendar year quickly approaching, many of you are looking at your two-way radio budget and realizing you will have money left to spend. You want to spend it so you don't lose it, but you also want to be smart about what you purchase. Here are 11 ideas on ways to spend that left-over budget money. 1. Preventative Maintenance - Check it before you wreck it. Call your local radio repair shop and set up a preventative maintenance check. If you have a backbone system, a technician can come in and complete a tune up to make sure all of your equipment is running efficiently and is not in need of being replaced. You can also have your portables checked. Are they tuned and aligned properly? Are they programmed correctly? How are your batteries, antennas and belt clips? 2. New Batteries - How old are your batteries? The average battery life is 12-18 months, depending on usage. Old and under performing batteries can effect the operation of your radio. Another good idea is to have spare batteries for your radios, especially if they are being used on long and/or multiple shifts. 3. Spare Radios - In addition to having spare batteries, it is also a wise decision to have spare radios on hand. These can be programmed and ready to go in case one needs repair or an employee misplaces their radio. This would help to prevent communication down-time and helps to keep you efficiency to the level you are used to. 4. 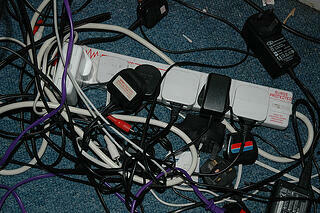 Multi-Unit Chargers - Do you have six plugs running into a power strip charging your radios? Have you thought about multi-unit chargers? These would allow you to charge up to six batteries at one times, from one device. This will help you keep your spare batteries charged as well as create a centralized charging location. 6. Earpieces - Earpieces are a great way to keep your two-way radios from being intrusive to your environment. They allow your people to have conversations without everyone else hearing them. If you don't have any, you may want to consider some. With the different varieties available, such as Bluetooth or "secret service style" surveillance kits, you will have your choice of what will work best for your organization. If you already have them, make sure to check your ear buds and acoustic tubes. These can get grotty over time and are easy to replace. 7. Cases - Your employees are carrying their radios around with them all day. They get banged, bumped and scratched. Investing in cases will help to keep down the physical wear and tear on the units. 8. Battery Fleet Management - Motorola Solutions has an IMPRES Battery Fleet Management system. This works with IMPRES batteries and allows you to monitor battery usage and make an informed decision when it comes to replacing your batteries. 9. Digital Conversions - There are many benefits of converting from analog to digital. We have covered this in previous blog posts (/bid/106819/6-Things-About-Digital-Two-Way-Radios-Your-Boss-Wants-To-Know and/bid/38413/Digital-Two-Way-Radios-The-Future-of-Professional-Radios so why not start now? You can do a slow conversion of your fleet or do it all at once, whatever works best for your organization. 10. Maintenance Contracts - No one lies getting repair bills they did not anticipate. Consider purchasing a maintenance contract to help prevent this. Having a contract will allow you to budget for your repairs and increase your peace of mind. 11. Radio Repair Bank - Having a radio repair bank is an alternative to a maintenance contract. This works on a debit basis where you pre-pay for repairs allowing you to utilize budget money now, and as your radios need repairs or preventative maintenance checks, the amount gets deducted from that bank. These are just a few ways to use that left-over budget money. Your local sales rep can help you decided what works best for your company. Don't let that budget money go to waste, contact them today. You've done your research, you're convinced your company needs to upgrade to digital radios, now your obstacle is to convince your boss. How do you explain to them the benefits of using digital radios. Here are 6 things that they want to and need to know about converting to digital. 1- You do not have to convert all of your radios at once (but you can) - Many digital radio models also function in analog mode. What this means is you can slowly replace radios as the need arises and have the radios programmed in analog mode. Once all of your radios are purchased and you're ready to flip over to digital all it takes is reprogramming the radios. If you want to purchase all of the radios at one time but financing is an issue, inquire about leasing options. 2- Long term costs will be reduced - Digital radios and analog radios use about the same amount of power in stand by mode however once you begin transmitting and receiving, digital radios are much more energy efficient. On average their battery life is increased 40% over analog. This leads to long term savings since you won't have to replace your batteries as often. 3- Better Voice Quality - When you transmit using an analog radio every sound, every background noise is transmitted. When you transmit using a digital radio voice clarity is exceptional. The noise suppression technology allows the transmittal to come through without the background interference. Watch this quick demonstration to see (and hear) what I mean. 4- Better Coverage - Depending on your environment and your frequency band, your radios only cover so much area. When you use an analog radio, the closer to the end of your coverage area you are, the weaker your quality is - think similiar to a cell phone in a poor signal area. While your coverage area with a digital radio will be about the same as your analog, the sound quality will not. The features of the digital software, the built-in error correction, will allow you to communicate clearly throughout your entire coverage area. 5- Better Capacity - Spectrum efficiency has been a hot button issue lately. The FCC required commercial two-way radios to be narrowbanded which means operating on 12.5 kHz instead of the previous 25 kHz. Digital repeaters allow for two talk paths - in essence two "channels" while only using one repeater with one channel. This not only allows you to have more users but also less equipment and less licensing which decreases your costs. 6- You Can Connect Multiple Locations - In the past, in order for your multiple locations to be able to communicate with each other, you would have had to install a very complicated, very complex, and very expensive system. Now you have the ability to link your locations using IP Site Connect. What this means, simply put, you put a digital repeater at each location and then connect them over IP. Think of the possibilities. Your maintenance workers in your lower Manhattan facility talking to the security officers in your Jersey City location. Your boss will think you are brilliant! Take these points to your boss. Explain how you will increase quality while decreasing long-term spending. Digital Radios are the future, make sure your company is on board. Go ahead and take credit for figuring it all out - we won't tell. Spring is a time of renewal, a time for cleaning out the old and a time for fresh starts. This is true for so many aspect of life. We clean our closets of old clothes, we clean the dust bunnies from under our couches, and we clean the dead wood from our gardens but did you think to clean out your dead batteries? How about your broken earpieces? Spring is not just for cleaning our homes but also a great time to "clean" our communications. When was the last time you took a look through your entire radio fleet? By taking just a few minutes now you can prepare yourself and as Confucius said "success depends upon previous preparation, and without such preparation there is sure to be failure." Below are our top "6 Tips For Spring Cleaning Your Radios." Battery Check - The average life on your two-way radio batteries is 12-18 months. An old battery can effect the performance of your radio. 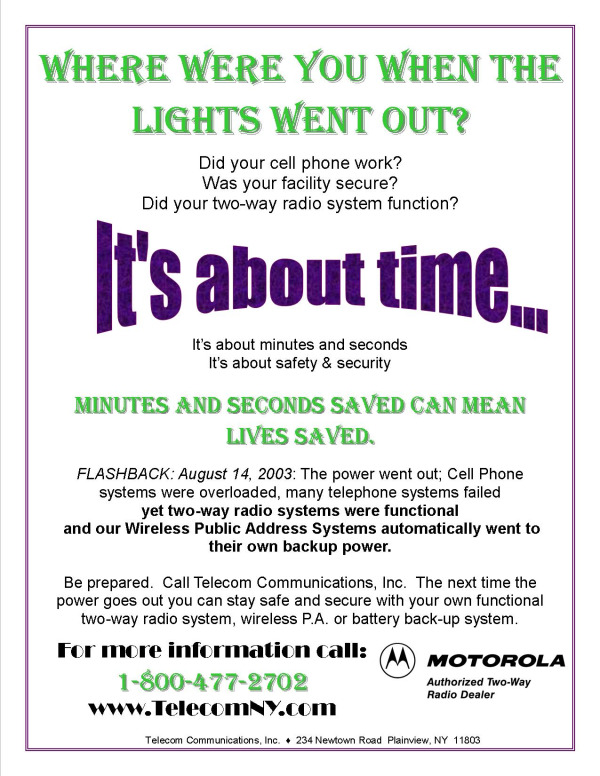 Motorola Solutions, Inc. has a quick way to check the age of your battery. Their batteries come with a date code that tells you when the battery was manufactured. This is a handy guide to estimating the age of it. Inventory Check - Throughout the year your radios are moved to different departments, taken out of service and/or new radios are purchased. Now is a great time to do a quick inventory check. Are all of your radios accounted for? Are they programmed to your current matrix? Are the IDs correct? By organizing now you will be able to prepare for the future. Knowing exactly what you have can help to prevent surprise purchases and allow you to budget for future needed equipment. Accessory Check - Are all of your earpieces accounted for? Have you hired new employees but neglected to replace the earbuds for them? Are any of your belt clips broken? Do you have the correct antennas on your radios? Are your chargers functioning properly? Are there a whole slew of single unit chargers floating around the office? Perhaps it's time to invest in some 6 unit multi-unit chargers to centralize your charging locations. It's the little things that make life and work easier. Broken Radios - Are you like many others and have a box of broken radios sitting on the floor in your office that you haven't gotten around to sending in for repair? Now is the time to do it. Qualified repair technicians can have those radios repaired and back into your fleet in a timely manner. Do you have some radios that have come back unrepairable, perhaps due to water or physical damage, and you are unsure of what to do with them? Until May 1, 2015 Motorola Solutions, Inc. is offering a trade in promotion. Turn what you thought was garbage into credit towards a new radio purchase. Have you inquired about a maintenance contract? This is an easy way to budget repairs for the future. Backbone Preventative Maintenance - Do you have a repeater installed at your location? When was the last time you had a preventative maintenance service call on it? Being proactive now helps to avoid emergencies later. A qualified technician can check out your equipment to ensure everything is running properly and efficiently. FCC License - Are the channels you are operating on licensed to your company? Is your license up to date? Have your radios been narrowbanded to fulfill the FCC requirements from January 1, 2013? By asking yourself these questions and performing these tasks you will be well on your way to organizing your two-way radio fleet. For more information, contact us. Our trained and certified staff can help you optimize your two-way radio communications. Motorola Solutions, Inc. has recently announced an addition to their ever growing MOTOTRBO portfolio, the new SL300 portable radio. This innovative radio measures less than an inch thick and can easily be carried in a pocket or purse. It's ergonomic design allows one-handed operation, similar to that of a cell phone. It has a shatterproof Active View display that uses a matrix of LED lights behind the radio housing to communicate radio information and shuts off when not in use to conserve battery life. It is both analog and digital capable which allows you to get all the benefits of digital, including better voice quality, better range and better battery life—but retain compatibility with your existing radio fleet. With analog and digital capability, you have the freedom to migrate to the latest technology at your own pace. This is the perfect radio for retail, hospitality and education (just to name a few). You spoke, we listened. 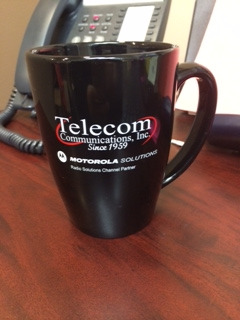 Telecom Communications, Inc. is proud to announce the launch of our revamped website www.TelecomNY.com. Our new site has been updated to include and highlight what you told us was important to you. The many videos on our site cover everything from the history of Telecom and Motorola to product spotlights including the MOTOTRBO SL 7550, accessories like remote speaker mics and MOTOTRB O applications along with industry solutions for manufacturing and hospitality to name a few. www.TelecomNY.com is continually updated with our current promotions and you can easily request a quote right from the website. Have a cup of coffee, stop by and take a look around - make sure to drop us a comment and let us know what you think. We are looking forward to hearing what you have to say. Power outages spread throughout eight states in the Northeast and Canada. Millions of people were without power, cell phone systems were overloaded and many phone systems failed yet two-way radio systems were functional and Wireless Public Address Systems automatically went to their own battery backup power. Thinking about this blackout, along with the upcoming hurricane season, you should be asking yourself some questions. 1- Is my business prepared? 2- Would my facility be secure? 3- Is my battery backup prepared to handle an outage? 4- How would we communicate if the power went out? Taking a few minutes to ask yourself these questions today can save you worry, time and money in the future. It pays to be prepared. Are your Business Communications Prepared for an Emergency? It's officially hurricane season. 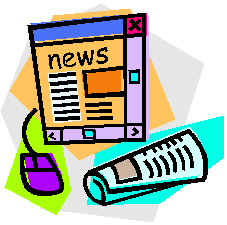 Everywhere you turn you see articles and newscasts discussing how to prepare your home in case of an emergency, what to pack in a disaster kit, what to know about shelters and so on and so forth. But have you thought about your business? I'm not talking about taping your windows, I'm talking about your communications. Your business communications are extremely important to the safety of your employees. It could be a blackout, a hurricane or another natural disaster or anything that will require your business to use their emergency plans. Did you include your communications when you were formulating these plans? Relying on cell phones is not the way to go. Circuits become overcrowded and calls can't always get through. Okay I got your attention, now what do you need to do to have your communications prepared? Here are some questions you should ask yourself before an emergency situation arrives. Do you have a battery backup for your repeater? Your repeater runs on electrical power. If you have a power failure you will lose your repeater. Even if you have a battery backup, some repeaters go into a fail-safe mode when a surge is detected. Do you know how to reset your repeater properly? How long is your auxiliary power for? You have a battery backup - great. Now the question is, how long is it good for? Make sure you plan what you will do after that time expires. Are your radio communications on generator power? If you don't know the answer to this, they probably aren't. Consider getting a generator to extend your power in the event of an emergency. Do you have simplex channels programmed in your radios? A simplex channel communicates directly from radio to radio without using a repeater. This can also be called a "talk-around" channel. Your normal communications may require a repeater to function how you need them to. In the case of a repeater failure, having the simplex channel will allow you to still communicate although there will be limited coverage compared to how your normally communicate using your repeater. Some communications are better then no communications. Do you have spare batteries? This may seem like a silly question but having spare batteries that are fully charged will give you extra time to communicate if you lose power. Is your infrastructure equipment on the floor? If at all possible, move your equipment off the floor in case of flooding. Are you tower and/or antenna structures secure? Checking the security of your antenna and/or tower structures is something you want to do prior to an emergency. Through time and weather conditions these structures can weaken. We recommend having this checked at least once a year. The above questions are just a few that you should be asking yourself on a regular basis to limit the issues caused to your communications by an emergency. Being from the New York area, we have all lived through enough of these emergencies to know that communications can make a difference. If you would like help in evaluating or have questions regarding your communications plan, contact Telecom Communications. Our staff is trained to know what you need. Telecom Communications has recently launched our Google + page as another way to stay in touch with our clients and friends. Check us out and make sure to follow us for updates on new products, promotions, industry news and tips.